After a simplified — but not simplistic — approach to the theoretical aspects of phase in our last article, today we will see in which cases you may find yourself having to deal with phase problems. Phase problems begin when we want to mix different signals from the same source. A textbook case is recording a bass guitar with a DI box and a mic placed in front of the amp. Considering that the speed of sound traveling in air is slower than that of the electric signal passing through the DI, you will immediately end up with comb filtering. The same applies when you record a guitar amp with several mics. The distance to the source can't be exactly the same for all of them, so you will inevitably have trouble. But these situations aren't the worst, because the sources are "fixed," which means that the phase problems will be constant and, thus, can be easily corrected, as we will see later. The real problems start when you record an acoustic instrument with multiple microphones. The musician will inevitably move, making the distance between the mics and the source totally random and unpredictable. The resulting comb filtering will be more complicated to deal with. The same problem arises with stereo recordings, and it's even worse with 5.1 systems. You should never forget that your productions are still likely to be listened to in mono. (When stereo or surround mixes are combined into a mono signal, comb filtering resulting from phase differences can degrade the sound quality.) And, anyway, more often than not, whenever recording an instrument in stereo you will also record it using (mono) close-up mics. 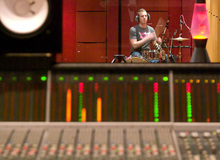 Take drums, for instance, where you have a pair of overheads and individual mics for each drum. And don't forget that mic bleed will also factor in. You might think problems stop there. And, yet, even when you record with one single microphone you can have phase problems. This time around, it's the reflections created by sound reflecting on the surroundings that mess up the signal. As you can see, phase problems are everywhere when you record. You can go mad from comb filtering — and this is only the beginning! When you're mixing, giving the final touches to your songs, it's not unusual for you to use spatialization effects (delay, reverb, etc.) to gain some width, depth or both. These effects are often at the source of many phase problems when mixing the "dry" (original) and "wet" (processed) signals. Parallel processing of a track, with the NY compression technique, for instance, can also lead to phase problems for the same reason. On the other hand, if you succeeded in controlling phase problems when recording a source with several mics, you can have problems during mixdown by simply using an EQ on one of the tracks of that instrument, but not on the others. Likewise, the technique of fattening a sound by doubling a track, applying to it a different EQ and panning it to the other side of the stereo field, will inevitably result in an offset for certain frequencies, leading to a mess when listening to it in mono. As you have seen, there are lots of potentially problematic situations. But don't panic, there are solutions, too. We will show you how to deal with these problems in the next article. However, if you are really eager and can't wait for that moment to come, don't hesitate to post your questions in the forum where the active community will be glad to help you out! !